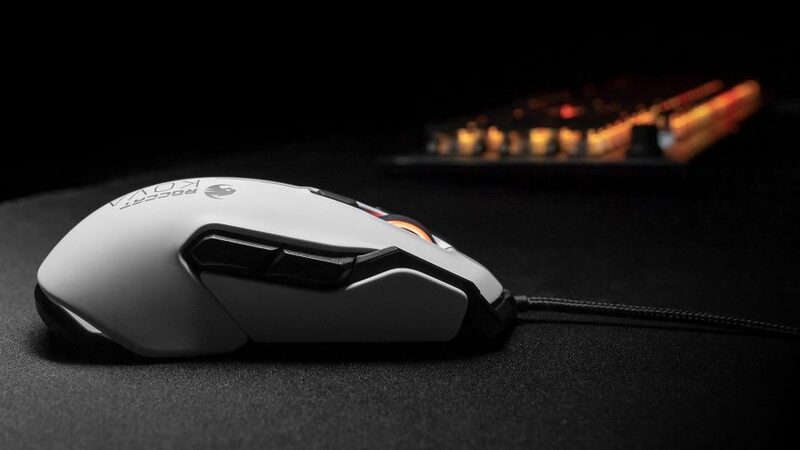 The bright sparks over at Roccat have put together another mouse for its AIMO lineup – and this one’s more left-leaning than an issue of The Guardian. With an ergonomic design mirrored right down the middle, the Roccat Kova AIMO brings sleek styling and a little AIMO love to all you lefties out there. The Kova AIMO joins the likes of the beautiful Kone AIMO gaming mouse, Roccat Vulcan gaming keyboard, and Khan AIMO gaming headset. Each device features fully-fledged RGB lighting with up to 16.8 million colours, but, once connected via the Swarm app, can dance and swirl together in a synchronised, multi-coloured jamboree. This particular model is the AIMO remake of the Roccat Kova, although they are identical in every other aspect. Absolutely identical. There are just two RGB zones on the Kova: one on the scroll wheel and one across the rear underbelly of the mouse. The latter is relatively low-key, however, and is visible only in very low-light conditions, e.g. complete darkness. Due to the limited number of zones, there’s no gradient lighting fun to be had, either. Roccat has avoided the over enthusiastic RGB lighting pitfalls and kept RGB lighting to a suitable minimum. It has adhered to its signature style – one that I’m rather fond of – incorporating soft curves into the design all the while maintaining a sleek and comfortable footprint. The mouse is exceptionally low-profile, however, which is something to consider if you prefer a little more palm support. The thumb switches are well within reach, too – no matter which hand you prefer. Rather than offer removable thumb switches or covers, Roccat has opted to simply plonk two lots of identical buttons on either side of the mouse. But not to worry, these are well out of the way of your fingers, and it would take someone with a peculiar grip to depress either side by accident. There’s also a single switch on either side of the left and right mouse buttons, and either can be operated no matter your grip. Last but not least there’s a single DPI button located below the scroll wheel. Textbook stuff. Easy-shift functionality has made a return once again with the Kova AIMO, however, meaning its handful of switches can be doubled up for bountiful combinations of shortcuts, macros, and gaming presets – all addressable via the Roccat Swarm app. 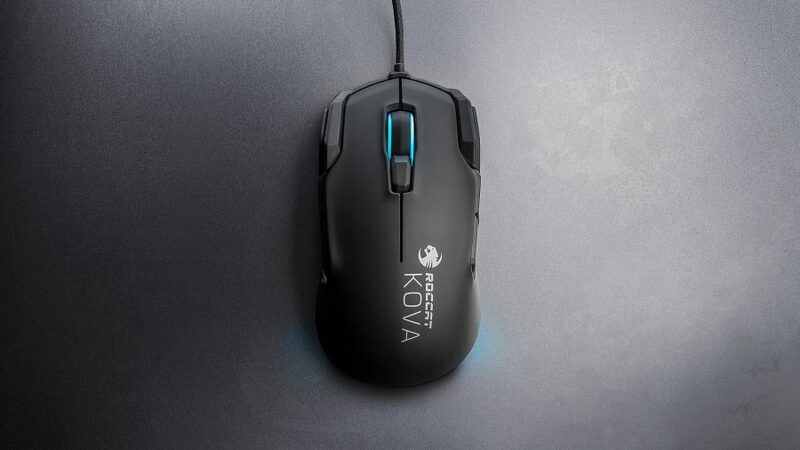 At 99g the Kova AIMO is bang smack in the middle of the mouse weight scale. A somewhat healthy average for gamers that don’t demand featherweight rodents, although nothing spectacular. Making up some of that weight is the Pro-Optic Sensor R6, capable of up to 7,000 DPI. Sort of. Technically it’s actually only delivering a native 3,500 DPI, as is its predecessor, the near-identical Roccat Kova, and gets to 7,000 DPI via overdriving the sensor. Even though that’s likely more than enough for many of you, it’s worth bearing in mind the sensor is using a little bit of software trickery to get up to speed. It can also only deal with 20G acceleration, which makes it a little less able than some similarly wired mice in this price range. However, since performance was on point in-game, with no noticeable jittering or wild, unexpected behaviour, you’ll find no quarrel here. Roccat has put together an RGB gaming mouse for even the most restrained among us – and one that doesn’t discriminate against the sinister lefties either. But while it does offer a healthy modicum of gaming prowess for its £53 price tag, it’s entirely gosh-darn identical to the Roccat Kova besides a hook for AIMO. And manufacturers seemingly value their proprietary lighting systems highly. Some may say too much so. Certainly the £13 AIMO tax here seems utterly unnecessary unless you absolutely, positively have to operate a purestrain Roccat lighting system across your desktop. And, with only a proprietary lighting system between the two, I can’t see many gamers, aside from the most loyal/obsessive of Roccat customers, opting for the Kova AIMO over its £40 twin. 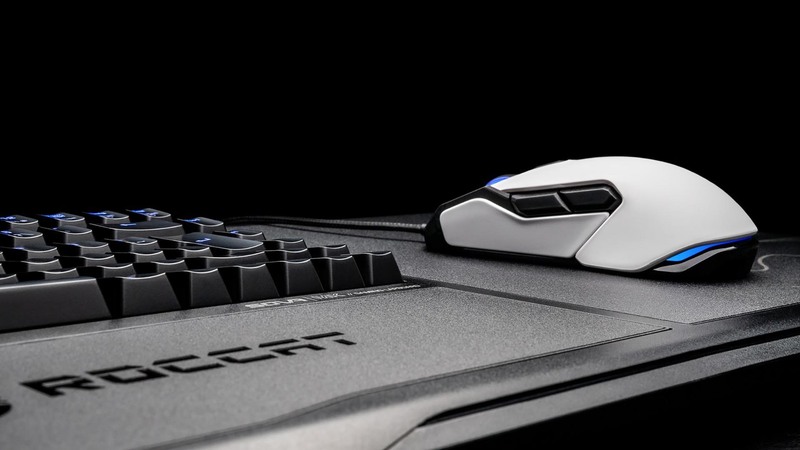 Roccat has replicated the near-identical Roccat Kova, but with added AIMO tax. As such, it's difficult to recommend this capable mouse over its cheaper, just-as-capable predecessor, despite its successes.